This week I was confronted, or should that be ‘affronted’, by an MX-5 with a folding metal roof and an automatic transmission. I am something of a traditionalist, so my choice of MX-5 would initially be a ragtop, with a manual transmission. So, here's a 2.0L engine; a 6-speed auto and folding metal hardtop. What sort of a sports car is this? I’ll tell you – it’s great. 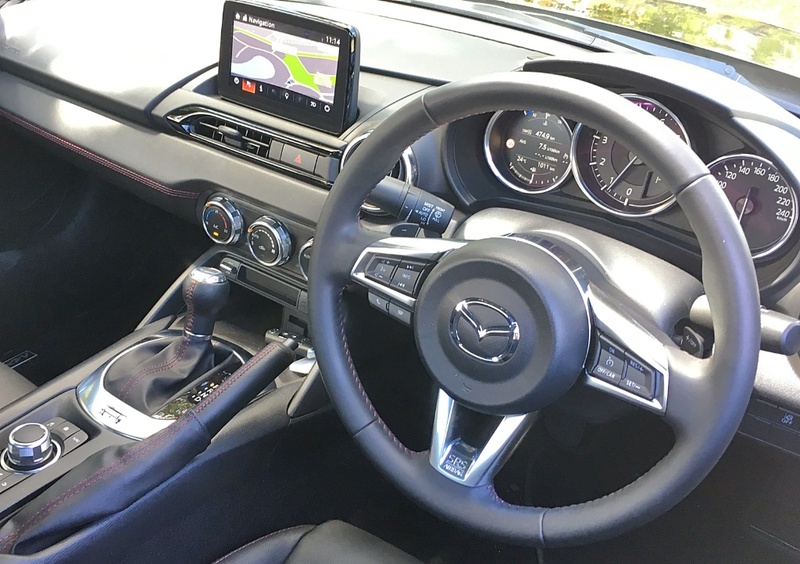 The Mazda auto is a torque-convertor type, with steering wheel paddles, and it’s as smooth as silk. 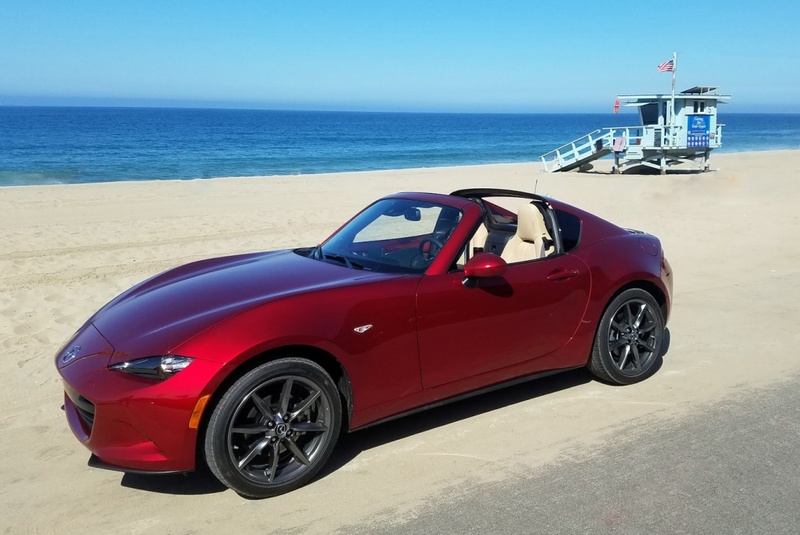 As far as an audience is concerned, I can see this car being a real favourite with women in southern California, with a penchant for speed and handling, but the option of a closed roof; or wind in the hair. This car may appeal to many fewer people in Australia, but its real target market is southern California (or Florida), the home of the slush-box, and the comfort of a cool/warm, air-conditioned cabin. The design also helps preserve expensive hairdos as well. 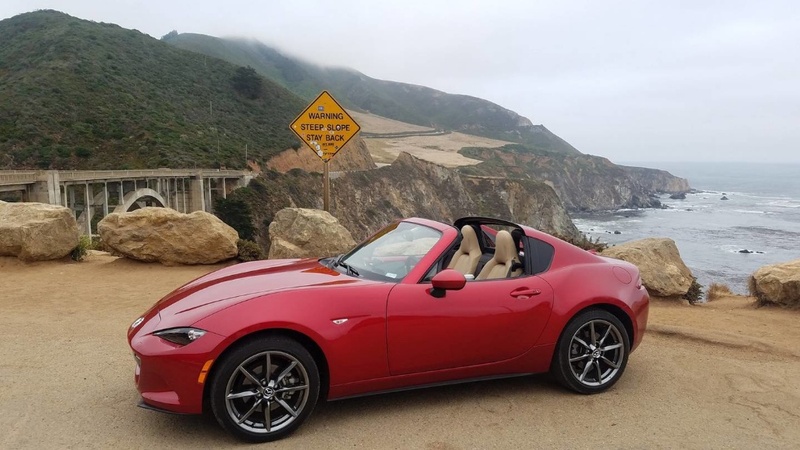 The RF (retractable folding roof) is about 50kg heavier than the roadster, and the suspension settings are stiffer – there’s also a lot of road noise from the Bridgestone Potenza tyres, which are all contributors, I think, that could actually limit this car’s appeal to women. However, the PR Manager for Mazda North America tells me that the RF is very popular with women. However, despite all this I’m pleased to report the RF has not relinquished one iota of the MX5’s famed agility and feedback to the driver. Both models are responsive, and one benefit of the auto version I rate highly are the gearshift paddles, which quite frankly I think makes cars more enjoyable to drive quickly, than stirring a manual. 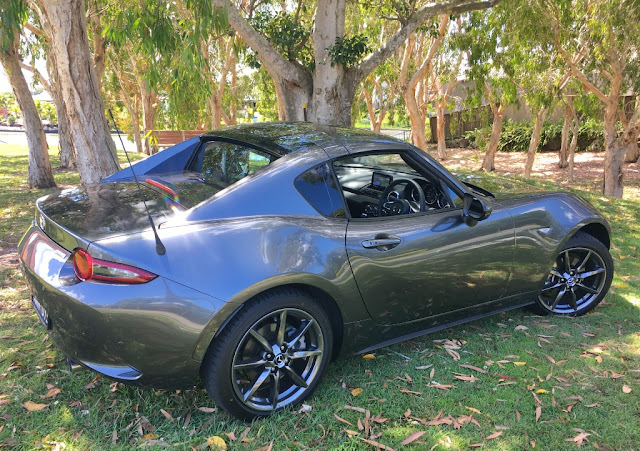 The MX-5 RF auto is about AUD$45,000 – but its competition are all priced in the same region, it’s just a matter of personal taste.